LESS THAN 10 HOURS USE SINCE NEW! IF YOU DON'T KNOW WHAT THI IS. SOLID, BUILT LIKE A TANK, AMERICAN MADE , CLEAR, WARM. THE HOLY GRAIL OF TUBE PRE-AMPS, SIMPLY THE BEST! THIS GREAT HIGHLY COVETED TUBE PRE AND DI WERE DISCONTINUED WHEN GROOVE TUBES WAS BOUGHT OUT. THEY ARE HIGHLY SOUGHT AFTER, AND FOR GOOD REASON. HEAVENLY TONE LIVE ON STAGE OR IN THE RECORDING STUDIO. IT DOESN'T MATTER IF YOUR CABLE IS 100 FEET LONG. Mint, like new, tube pre-amp and DI. This clear warm pre-amp makes everything sound better: Vocals, Guitar, Bass, Drums, and More! As a mic preamp, The Brick can handle anything from capacitor mics that require phantom power to less sensitive dynamic and ribbon mics, with an available gain range of 25 to 55dB, The circuitry, much of which is derived from the much more expensive Vipre preamp, features three tube stages plus a transformer-balanced (floating) output stage that claims to be able to drive cable runs in excess of 1000 feet! The Brick doubles as a high input impedance instrument DI box with up to 30dB of gain, that is suitable for both studio and live-sound applications. It can handle guitars and basses, which is useful if you want to use software modelling to shape the sound after recording, and it works well with keyboards too, albeit in mono. There's also an instrument Thru connection, so you can take a DI feed without interrupting the connection between the instrument and its usual amplifier. Groove Tubes even recommend the Brick as a balanced line driver following a stage effects pedalboard, or even a digital guitar preamp. For direct recording, the tube circuitry within the Brick can also add a degree of tonal warmth , which may be attractive to those using digital products as a sound source. Some players also plug DI boxes into the effects return socket of their guitar amps, to create ultra-sweet clean tones in the studio and, again, The Brick will be ideal for this application. This is the second Brick I've bought and the most used out of my 5 preamp choices. I replaced the 12AX7 with a USA Sylvania and the 12AU7 with an old black-plate RCA. This opened the top end a little more and made everything sound clearer. The preamp sounds good and phat right out of the box though. The input and output transformers really color the sound in a good way. Everything has big booty and almost sounds a pinched compressed or the image is smeared in a good way. I bought 2 and find them warm and has more than enough gain and color to work as both a bass [or guitar] DI and also sound great with ribbon mics adding a little color to the guitar sound. It has no frills but I like that. The Ultimate DI and Mic/Instrument Preamp for Stage and Studio. Arguably the most fully featured piece of studio or stage gear, Groove Tubes' The Brick does a whole lot in a single, super-rugged package. Not only is The Brick the ultimate DI box and instrument preamp for injecting a bit of good ol' tube tone into your signal onstage and in the studio, it's a fantastic mic pre. Plug in your favorite mic - condenser, dynamic, or ribbon - and enjoy the unmistakable fatness that can only mean tube and transformers! The isolated balanced low impedance output lets you run any instrument or mic signal over very long cable runs with no signal degradation. 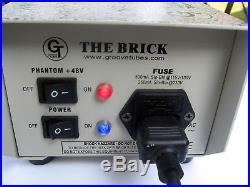 The Brick also provides either unity gain or variable output level control for up to 55dB of all-tube gain! The Brick offers perfect tube tone and isolation for vintage keyboards, electric bass and acoustic/electric guitars with internal transducer type pickups. Plus, onboard phantom power allows the use of high quality condenser mics on stage. Best of all, The Brick is very aptly named, giving you a solid performer that's right at home in the studio, but is so rugged that even the most demanding tours won't phase it! Groove Tubes The Brick at a Glance. A tube mic/instrument pre for the studio. A tube mic/instrument pre for the stage. Phantom power, true transformer output, plus an available gain of +55db. 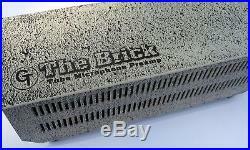 The Brick will handle dynamic mics, condenser mics, and ribbon mics. 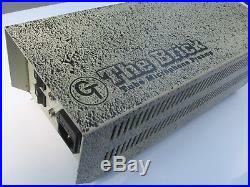 The Brick can run 1000 feet and more without the losses of simple direct boxes. Some other uses for The Brick. Direct to console - Use acoustic/electrified guitar - input directly to a recording console for warmth and proper impedance matching. Live to sound reinforcement console - In a live performance, long unbalanced cable runs can compromize your tone. Use the Brick with keyboards or rack systems to set your equipment levels to the best signal-to-noise ratio. The result is improved sound quality over long cable runs. A must for guitar players with pedal boards - You have a large investment in a pedal board. Unfortunately, long cable runs (over 25' in many cases) from the pedal board to your amp does little for sound quality. Let "The Brick" handle the task of proper signal balance and drive; set the effects level for the best sound and let The Brick handle the rest. POD 2.0 and PODxt users - whether recording direct or in live performance, placing The Brick between the POD and amp, recorder, console, or house system will add tube feel and warmth. Proper output level can now be set on the POD so that the signal to noise ratio is optimized, rather than trying to have the POD generate the desired gain. In the high gain POD models, this can reduce noise to the amp, console, or recorder for a cleaner and quieter signal. Make your guitar, bass, keyboard, or less expensive dynamic microphone sound better - the transformer balanced tube circuitry are the keys for proper matching to your instrument. 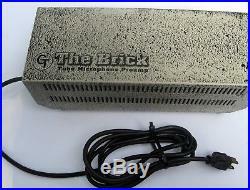 The Brick makes a great preamp for amps with effects loops. Amps such as Marshall or Mesa Boogie have a signature tone based on their preamp design. If you'd like to get a very clean sound for acoustic/electric guitar, you can bypass the amplifier's preamp using The Brick. First, plug your guitar into The Brick. Using an XLR to 1/4" cable, go XLR out from The Brick and then plug the 1/4" end of the cable to the amps effects return, thus bypassing the amplifier's preamp section providing the clean sound that acoustic guitarists have come to love. Using The Brick in this fashion effectively doubles the use of your amp. The latest Fender Pro Tube series amps (Pro Twin, Pro Concert, and Pro Reverb) have a pre out / main in set of jacks. Use the main in, as it is specifically designed for this sort of use. Use The Brick in live applications with the guitar plugged into the Brick's 1/4" input, and then run a cable from the second 1/4" input to your amp. There will be no processing on your signal to the amp. Then take the XLR output to the house system. This allows a mix of your amps output and also allows you to control what level goes to the house system from the stage. Groove Tubes The Brick Features. 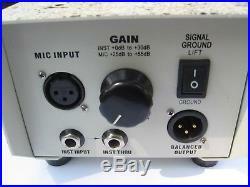 +55dB of tube gain to any studio mic. Unique rugged steel package and special internal construction. 3 internal tubes and massive custom output transformer can drive a signal 100's of feet with no loss. Accepts unbalanced line or instrument level signal and output a balanced signal. Capable of amplifying up to +30dB. Use the Brick as a neutral D.
The Brick will pre-amplify any line or instrument signals directly into a +4 or -10 Line input stage of your mixer or recorder. High Impedance for use with Electric Guitar Electro-Acoustic Guitar Piezo-electric Pickups Electric Bass Electronic Keyboard Electronic Synthesizer. Line Level Signals Output Level Nominal +4 dBm Maximum +16 dBm terminated at 600 Ohms. On/Off switch External fuse holder. Primary input voltage is Internally selectable between 120v and 240v 50-60 Hertz. FIVE POUNDS OF SPECTACULAR SOUND. 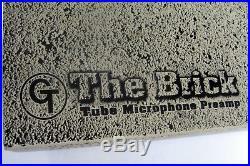 The Brick from Groove Tubes is the foundation for great live and studio sound! The item "Groove Tubes The Brick Tube Mic Microphone Preamp & DI" is in sale since Monday, August 27, 2018. This item is in the category "Musical Instruments & Gear\Pro Audio Equipment\Preamps & Channel Strips". The seller is "googah" and is located in Fredericksburg, Virginia. This item can be shipped to United States, Canada, United Kingdom, Denmark, Romania, Slovakia, Bulgaria, Czech republic, Finland, Hungary, Latvia, Lithuania, Malta, Estonia, Australia, Greece, Portugal, Cyprus, Slovenia, Japan, China, Sweden, South Korea, Indonesia, Taiwan, Thailand, Belgium, France, Hong Kong, Ireland, Netherlands, Poland, Spain, Italy, Germany, Austria, Israel, Mexico, New Zealand, Singapore, Switzerland, Norway, Saudi arabia, Ukraine, United arab emirates, Qatar, Kuwait, Bahrain, Croatia, Malaysia.